We do not offer and seldom recommend the vitrectomy procedure for removal of isolated vitreous floaters because even in the best of hands the procedure has a high rate of significant complications. Approximately 50 per cent of patients over 50 years old get a cataract within five years. Below age 50 the rate of cataract formation is much less. There is also a significant rate of retinal tears and retinal detachment, and a lesser rate of infection and leaks from the incisions. Even with these complications, vitrectomy remains an invaluable technology for treating some diseases. With the vitrectomy procedure it is possible to remove all the vitreous of the eye and any floaters it contains. The procedure is usually quite imprecise for floaters so instead of removing just the floaters, they attempt to remove most of the vitreous in hopes on removing the floaters in the process. The surgical technique and instrumentation of vitrectomy was largely perfected at Duke University Eye Center where Dr. Karickhoff received his ophthalmology training and remains on their Advisory Board. What Does the Vitrectomy Procedure Consist of? The procedure consists of opening the outer layer of the eye and then making three incisions through the inner wall of the eye. A tube to supply saline into the eye during the procedure is inserted into the eye through the first incision and sewed in place. A fiberoptic light pipe is inserted through the second incision, and a sucker-cutter instrument is inserted through the third incision. The fluid inflow is started, the light is turned on, and the suction and cutting is started. 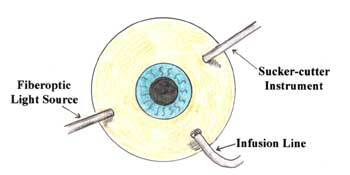 The vitreous is cut and sucked up and is replaced by saline. Vitrectomy was designed to be used to remove blood filled vitreous, and inflammatory or infection debrie. It can also be used in association with retinal detachment surgery or to remove small foreign bodies from the vitreous. By contrast, the laser treatment of floaters we offer is the result of laser research carried out specifically to avoid the dangers of vitrectomy noted above. What researchers dreamed of was a non-thermal, precise disruption of tissue without disturbing other ocular structures and without surgically opening the eye. Our laser procedure is a much safer procedure than vitrectomy, does get rid of the floaters not just break them into smaller floaters, and is not associated with the problems listed above of vitrectomy (See World Literature Listing on this web site). When Is The Vitrectomy Procedure Recommended? Vitrectomy may be recommended if the floater is truly debilitating, and it is too big to be removed by the safer laser procedure. We are more likely to recommend it if the patient has already had cataract removal (they now can't get a cataract) and if they have a posterior vitreous detachment (making retinal tears and detachment less likely).